The great thing about the Murray region for golf is you can take short trips along the river and link together a great golfing experience with unique courses and clubs. Use the Discover Murray Trail to visit some of the 41 courses in the Murray region and and have yourself a great Murray River golfing holiday. Information and contact details may be subject to change without notice. For fans of the small ball, you'll find a golfing paradise and manicured greens, sweeping fairways and elegant country clubs. Set within the delightful backdrop of Australia’s greatest river, the Murray, the area is an enormous sand belt - perfect for the proliferation of groomed championship and recreational courses. The amount of sunshine is legendary and so are the picturesque settings for golf. The courses are home to abundant wildlife populations so don’t be surprised if you’re sharing fairways with kangaroos and birds, along with fellow golfers. 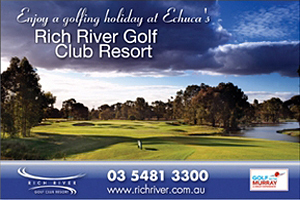 There’s something to suit every style and handicap, from Barham’s par 73 mid-river masterpiece, to the Rich River Golf Club Resort at Echuca-Moama, another exciting and varied test of golf...they're RV friendly too, making it a great place to park the RV and enjoy a relaxing time. 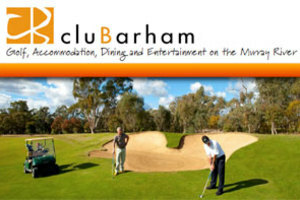 Don't go past the Cobram Barooga Golf Club located at the Barooga Sports Club. The Cobram Barooga Golf Club offers 36 holes of championship standard spread over the renowned Old Course and the newer West Course. Both courses offer a challenge to the serious golfer and are very playable for novice golfers. Considering the Murray River epitomises the region, you can’t pass up a round at Australia’s largest golf course, Yarrawonga and Border Golf Club - especially its 470 metre par five which snakes a few metres away from the river’s swirling waters. The combination of reds and greens at Corowa Golf Club are bound to please - the famous red wine of the nearby Rutherglen region and the 27 holes of undulating fairways and greens of the Corowa courses. 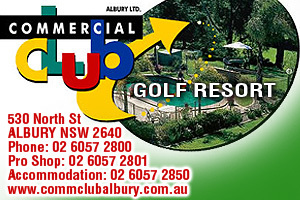 A little further along the river is another ‘gem’ of a course, the Commercial Golf Resort Albury. Other must-plays include the diverse challenges of Tocumwal Golf Club’s fine 36-hole layout, and one of the best maintained golf courses on the river - the Ted Parslow-designed course at Murray Downs Golf Club, near Swan Hill. Each Murray golf course offers a unique set of challenging and picturesque conditions as well as a comprehensive selection of amenities. There are golf shops, course professionals, plenty of fine dining and cool beverages, and on-course accommodation to augment some excellent golf. So pack the clubs in the car and experience a different 18 every day. Sand Greens. Course open from April until the end of September. Thompson and Wolveridge designed. Thurgoona is only 9km from Albury and 5km from the airport. A highly rated course with wide, undulating fairways, huge greens with tricky slopes, strategically placed bunkers and a splash of water to make some holes more interesting. The Thurgoona Country Club Resort is a 4 star property with 26 well-appointed modern suites overlooking Thurgoona Golf Course, featuring wireless broadband access, individual heating and cooling, mini bars, modern appliances, and remote control colour televisions. Guests may wish to have a round of golf, a hit of tennis or maybe just lounge around the outdoor pool or for the total relaxation a soak in the spa after having a sauna. The Thurgoona Country Club Resort offers full club facilities, a courtesy bus and superb bistro meals. Packages to suit individuals and groups. The 18 hole championship layout is built on 50 hectares of land. The course was designed by Kevin Hartley, Australian amateur golf champion of 1958 and runner up to Bruce Devlin in the 1959. The spacious layout consisting of the traditional 4 Par 3s, 4 Par 5s and 10 par 4s stretches out over 6289 metres for the men and 5326 metres for associates with an ACR rating of 73.2. There are 33 well positioned bunkers to keep the best of golfers honest. Two large dams on the front 9 and Felltimber Creek snaking through the back nine make for a picturesque and challenging day out. In designing the course Kevin has taken advantage of the natural bush environment with native trees being an important feature. The Albury Golf Club is situated in the centre of Albury and boasts a superbly presented course which features a set of consistently wonderful greens regarded as the best in country NSW and is at least the equal of the majority of metropolitan clubs in Melbourne or Sydney. The course presents a real challenge to championship golfers with its tree lined fairways and well placed bunkers, whilst allowing sufficient leeway for all standards to enjoy the layout. The cut fairways are more generous than some championship layouts. This is an excellent summer course with the tree lined fairways giving the area soft shady atmosphere. The Rutherglen Golf Club is an 18-hole sand scrape golf course that is adjacent to the town centre; the clubhouse and first hole are about 500 m from the major town cross road. The course is a testing one of 5321 metres for men and 5068 metres for ladies, with a par of 69 for men and 71 for ladies. The ACR is 66. With the benefits of recycled water, the course is well maintained and remains open throughout the year. Visitors regularly compliment the quality of the course. The ladies run a 9 hole event on Monday mornings, and an 18 hole event on Wednesday mornings. The ladies also run events on the weekends. The men have 18 hole events on Saturday and Sunday and ladies are welcome to also play at these times. On Friday afternoons there is a chook run for all comers, handicapped and non-handicapped players are all welcome. Playing on sand scrapes seems to phase some golfers but experienced sand scrape players simply regard them as a different challenge to greens. A chip and run game is mostly used and this strengthens the range of skills of the golfer; this is shown by the fact that most local golfers also play very successfully on courses with greens. 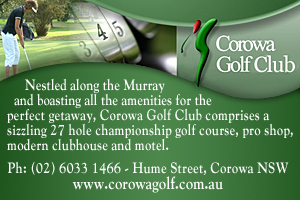 Just metres from the mighty Murray River and boasting magnificent scenery, Corowa Golf Club's course is a 27 hole championship-rated course offering challenges to all levels of golfing ability. The original course, one of the most charming to play in Australia, was designed by Al Howard and established in 1955. It is nestled amongst river gums along the course of the Murray River and offers golfers of all abilities a challenging and rewarding round that only a course of this age can. Adam and Marcus Fraser, James McLean and Brent O'Donoghue learned their craft on this course. The front 9 holes, also designed by Al Howard, were established in 1980. The front 9 fairways are mostly long and open, unlike the old course, offering the variety some golfers may prefer. The course itself is rated in the top 100 public-access golf courses in the country. There are practice areas for both putting and driving, with tuition available from the pro shop. A superb 18-hole golf course that will appeal to all golfers. It is a challenge and you will relish a friendly round with your peers. One of the most popular golf courses on the Murray River. The course is always in immaculate condition and is regarded as one of the best all-weather courses in the district. During the winter, the course is well drained with fairways and greens in outstanding condition. In spring this is further heightened when many of our native trees flower. Flat and well drained, with fairways and grass greens kept in peek conditions. Beautifully landscaped lakes provide a water challenge to four holes and a number of well- placed bunkers will test your golfing prowess. Spectacular trees and manicured gardens are a haven for birdlife and wild ducks on the lake. The golf course appeals to all ages as it is flat and the grass greens are kept in peak condition. 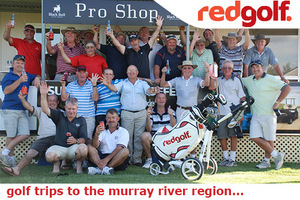 Redgolf customises golf trips, tours and short stay packages along the Murray River. For social and business golfing groups, we offer fun and innovative golf event formats, great prizes and memorable on-course photography. Based in Yarrawonga, we know the best courses to play, the best places to stay and the best post golf entertainment and activities on offer in the region. Visit the website for more details. Weekend golf packages, including cooked breakfasts and electric carts start from $280 per person twin share. Yarrawonga & Border Golf Club is the largest public access golf resort in Australia, with 45 holes of golfing paradise and includes a new driving range all less than 3 hours drive from Melbourne. Murray Course: Being one of the most popular courses along the Murray River, the Murray Course meanders through towering river gums and sandy river flats where numerous lakes and lagoons are ready to swallow the errant shot. Lake Course: The Lake Course is more open than the Murray with big gum trees, plenty of bunkers, strategically placed lakes and undulating greens. Executive Course: Complementing the two main courses is the shorter and picturesque Executive Course. It is much kinder to the beginner whilst still providing a worthy challenge and enjoyable golf in a natural parkland setting. With the first nine holes of the Black Bull Golf Course now open for play, golfers visiting this part of the Murray, will be able to enjoy the efforts put in by course Architects Peter Thompson, Ross Perrett and their brilliant design team. The exquisitely landscaped holes which are wrapped around the waters of Lake Mulwala, will provide an enjoyable experience for the Pro and novice alike. The Architects have attempted to design a course to excite the imagination and test players of all levels. With only six holes to be completed before the 18 holes are open for play, the front nine is just the entree' to the main "course" which we are all looking forward to. Cobram Barooga Golf Club offers 36 holes of championship standard spread over the renowned Old Course and the newer West Course. Both courses offer a challenge to the serious golfer and are very playable for novice golfers. The Old Course measures 6176 metres in length with a par of 72. The Old Course is very traditional in its design with many holes being framed by majestic Red gums and pines. The greens are fast and true with clever bunkering catching wayward shots struck into the greens. With many classic golf holes the Old Course is still the must play course in the area. The West Course differs from the old course in its design which is best described as a mixture of resort and modern links style, the West course is slightly longer than the Old with wider fairways larger undulating greens and well placed hazards. Discover Tocumwal Golf Club’s 36 Hole Championship Golf Course. Experience the history, charm and natural assets of this Murray River town only 3 hours drive from Melbourne. Tocumwal Golf Club invites you to experience this exceptional sporting venue on the Murray River. Here is a course that never closes - wet or dry regardless of the weather. Current home of the Southern PGA Trainee Championships and situated on Australia’s great Murray River. Green fee players are welcome seven days a week. Two immaculately presented Championship courses with excellent quick greens and gently undulating fairways of wintergreen couch. Captains Course is a 6272 metre Par 72 course, which has 9 new front holes while the back nine has 4 new and 5 old holes. Presidents Course At 6066 metres long with a Par of 72 the Presidents Course offers a vast challenge to all level of golfers. It features famous 4’s, thrilling 3’s and frightening 5’s. Some of the fairway bunkering is a highlight of this course, which contains the greater majority of holes form the original 18 hole layout. The course consists of 9 old front holes with the back 9 having 7 new and 2 old. With 18 perfectly manicured fairways the Deniliquin Golf Course is a shining example of Australia's magnificant country courses. Deniliquin is only a 40 minute drive from Echuca Moama. There's no need to book tee off times weeks in advance. Simply turn up and you are guarenteed a round without the need for booking. The club has a picturesque setting located between the CBD and the Deniliquin State Forest. The Deniliquin Golf Club can cater for functions and all golfing needs. Combined with the Deniliquin Golf and Leisure Resort there are many play and stay packages available.The club also holds may tournaments throughout the year open to both members and visitors. The Mathoura Golf Club offers a seasonal sandscrape course, which operates from April to October each year. Rich River Golf Club Resort offers some of the best golf in the country! Our two award winning 18 hole champion golf courses have developed over the years to become one of regional Australia's premier golfing venues. The par 72 West Course has traditional tree lined fairways with small tricky greens and takes the serious golfer on a 6183m journey. The par 72 East Course was redesigned by Peter Thompson in 1998 and features large greens, wide fairways, Thompson signature bunkers and covers 6131m. Both courses provide outstanding challenges for all players. Australian golf professional Stuart Appleby comments to US golf digest sums up a growing reputation among golfers who’ve played at Cohuna. That is, “If I had one round to play in my life… it would be there”! A well treed Murray River public golf course, Cohuna's extraordinary fairways and greens are set between towering river red gums alongside the picturesque Gunbower creek on Gunbower Island in Northern Victoria. Cohuna is a fully watered course. The fairways are lush most times of the year and are beautifully maintained thanks in part to an automated watering system and the sandy soil. The golf course is relatively flat with gentle undulating fairways, winding through the red gum forest, with some creek frontage and the occasional bunker. The main challenge when playing the course comes from tight fairways and fully-grown gum trees that line all fairways. Hitting straight and long will enable you to score well. Chances are that when you miss the fairway, the towering forest red gums will make a direct way to the dance floor a rarity. Golf at Cohuna usually brings encounters with native fauna that include kangaroos, varieties of Murray River bird life and the occasional emu. A nature playground and golfers sanctuary, the tranquil environment of Cohuna golf course epitomises the allure of golf on the Murray beyond the challenge of the game itself. It’s the view of many who have played the course that Cohuna is a better golf course than many of the higher profile Murray River courses. Located only 2 kilometres from the Murray River and the town centre and close to motels and shopping, the complex is nestled amid natural bush surrounds that make it an ideal destination for a sporting holiday, and at the end of the day you can take full advantage of the Complex's outstanding facilities. Barham Golf & Country Club is quickly developing as one of the major golfing destinations along the Murray. The club, in conjunction with noted golf course architect Ross Watson, has developed a masterplan that will continually improve and redefine the existing layout. Stage one, which was completed in 2003, has seen the construction of four new holes, a driving range and practice chipping green. The construction of the new 1st, 2nd, 3rd, & 9th holes and practice facilities were undertaken by Turnpoint Constructions, who built the 36 holes at Moonah Links on the Mornington Peninsula. The more recent completion of the 4th and 6th greens and bunkers has again lifted the standard at the Barham Golf & Country Club. Golfers will enjoy the beauty and challenge of Barham's par 73, championship course, part of the magnificent Golf and Country Club Complex. A magical retreat that also features 2 superb bowling greens and 14 lawn tennis courts. "Play Gallipoli and face the challenge." 5th Hole 392 metres Par 4. Only three + hours drive from Melbourne, you'll find that golf on the Murray at Murray Downs truly is first class. Widely acclaimed as being the Murray River's finest golf course, Murray Downs is ranked the undisputed Number 1 Golf Course along the Murray River by the leading golf and travel publication. It is the site of one of the most acclaimed and affordable golf course holiday destinations in Australia! Murray Downs has a great range of golf packages for the travelling golfer, The soil is a wonderful reddish brown, dotted by trees and tufts of natural grasses, making for a striking first impression. Man made lakes help with irrigation and drainage, and a mass of flowering native gums line all fairways. Couch grass fairways are superbly manicured and groomed with a defined second cut. Water hazards come into play on numerous holes and soft white sand adorns the bunkers. Although an easy walking golf course layout, small hills, bumps and rolls break the landscape. The bent grass greens are generally large, undulating and very fast with thoughtful tee positions, pin placements and excellent grooming. Everything that you would expect from a top ranking Murray River Golf Course is at Murray Downs. Nyah West Golf Club is a semi-private golf course however limited opportunities exist for non-members to play. 4 km north of Nyah you'll find the Nyah District Golf Club. Grass greens, gum tree environment with creek beside various fairways. Gently undulating, fully watered. Kangaroos and numerous parrots including endangered Grey Babblers. Tooleybuc Sporting Golf Club is a public golf course offering a wide range of playing times 7 days per week. Grass greens, flat terrain, substantial number of planted trees, entire course watered. Four holes bunkered and three lakes. Neat dress code. Mens Comp. Wed, Sat, Sun Ladies Comp. Tues, Thur, Sun Mixed Comp. Fri twilight nine holes daylight savingVisitors welcome to enter. Green fee players any day by arrangement. Club House: fully licensed, bar open from noon daily. Meals Thur - Sun evenings. Showers and changing rooms. Located close to the town centre, this course has excellent bent grass greens and challenging green side sand traps. The automatically irrigated fairways have a lush grass cover and strategically placed water hazards that challenge all golfers. The attractive new clubhouse has full bar facilities as well as a bistro dining area. The Mildura Golf Club owns and operates a 40-unit motel and boasts two attractive swimming pools and barbecue areas. An on-course professional operates a well-stocked pro shop and offers full tuition by appointment on the well-maintained practice fairway. Enjoy the challenge of this championship course at Dareton in New South Wales. Laid out on Murray River clay country, the fairways are sown with santa anna couch and the greens quick and subtly shaped. The modern, fully licensed clubhouse offers bar and dining facilities as well as gaming machines for guests and visitors. A resident golf professional operates a pro shop and offers tuition. On-course facilities: Licensed clubhouse. This challenging golf course has been built on flat country that features native mallee trees and vegetation and abundant bird life. Fairways are fully watered and the course has 18 grass greens, some of which are bent grass and some santa anna couch. The course design incorporates a number of interesting dog-leg par-four holes. The absence of sand bunkers and the challenging greens are the distinguishing features at Merbein. Visiting golfers never find it difficult to get on the course either as green fee or competition players. On-course facilities: Licensed clubhouse, warm-up net, practice putting greens. This golf course boasts lush santa anna couch fairways between stands of large river gums, western black box and natural bushland. The undulating tree-lined fairways wind their way around eight lakes, which come into play on nine of the course's holes. Tackle tricky bent grass greens, subtle contours and a true surface that will always reward a good putt. A modern clubhouse overlooks this unique golfing landscape. 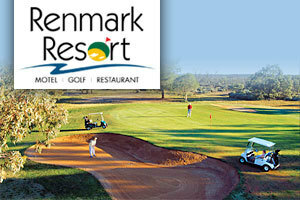 Renmark Golf Club is about 5 kilometres west of the Renmark township. Today the course is a lush oasis, with typical semi-arid landscape just outside the boundaries of the course. The course is set in parkland with 11 holes on flat tree lined country and the remainder have gently rolling undulations. Renmark's tight, tree lined, fully irrigated, grassed fairways demand accurate driving to reach the well maincured and bunkered greens. The course is both a joy and a challenge to play as one experiences this oasis in the sun. On course accommodation is available at the Renmark Country Club which has commanding views of the 12th and 13th fairways. The Loxton Golf course is located 8kms from the town of Loxton. Enjoyable for golfers at all levels the course is challenging but fair and rewarding for good play. The greens are regarded by many top golfers as among the best greens outside Adelaide for their consistency and high quality, including surrounds. Lush irrigated fairways provide a high standard playing surface all year, although, the course usually reaches it's peak during the winter season. There are sand bunkers on 10 holes and a varied range of grassy mounds on the surrounds of most holes. The course has an abundance of native shrubs and shade trees lining fairways and tees. A practice fairway, chipping and putting greens are available. Electric golf carts are also available for hire. The course is open 7 days apart from major events. Light traffic/immediate access most days. Beer, snacks and meals by arrangement. Group bookings welcome by appointment. See our website for full details. Berri Golf Club is on the edge of the town, set amidst natural mallee trees with complementary native plantings. The fairways and greens are all fully irrigated. Excellent bar facilities, meals, gaming and golf carts are available seven days a week. The par 71, 6019m (par 73, 5284m for women) course is a challenge. The irrigation is fully controlled and much of the rough is also watered meaning play is almost always on grass. The greens are a mixture of bent, cobra and pennlink grasses giving an excellent surface. Most fairway are a blend of couch, Kentucky blue and fescue but in recent times some have been converted to santa anna which thrives in the conditions. A feature of the course is the opening hole. It is a par three of 161m from an elevated tee landscaped with roses and shrubs and plays up a slight rise to a green set among tall gums. The signature hole is the par four eighth. It is a gentle dog let where the approach shot must avoid bunkers on both sides of the green. The eighteenth is played from a two tiered tee adjacent to the Big River Motor Inn and is also played under the watchful eye of those enjoying the facilities of the Big River Tavern at the clubhouse. Barmera Golf Club is right on the shores of the Murray in the heart of the Riverland. It is one of the five courses within a 45 minute driving radius. The fully irrigated couch fairways and greens would be the envy of many clubs. The course is a par 72 over 6,110m of gently undulating ground. Watch for the signature, 337m dogleg 15th hole. The clubhouse has lovely view of the 1st and 18th holes, a group of 9 magnificent tennis courts and Lake Bonney. It is open Tuesday to Sunday with regular men's and women's competitions. Accommodation is available with the beautifully appointed Barmera Country Club situated on the course proper. All rooms overlook fairways are are within easy walking distance of the 1st tee. The club house has full facilities including a bar, snacks and showers. Friday night teas are a feature. The Waikerie Golf Course is a well manicured course, lush fairways lined with a large variety of native trees and the sounds of a variety of native birds. The 18 hole fully irrigated course features large elevated greens surrounded by grassy mounds and hollows. The Waikerie Golf Course is nestled amongst the Sunlands citrus area in gently rolling sand hills, 11km west of Waikerie. Drop into our club rooms to register before you tee off. Enjoy a drink and a snack while overlooking the course from our well facilitated club rooms. Great views of the course from the club rooms lounge area. The dining area can also be booked for functions. Swan Reach Golf Club is a par 71, 5,531 metre 9 hole golf course. It is a semi-private golf course however limited opportunities exist for non-members to play. Mannum Golf Club is just over an hours drive east from Adelaide, situated at Mannum in the lower Murraylands region of South Australia. The course is a mix of flat and undulating land and has watered fairways and greens. Par is 73 for men and 72 for ladies. The course is a nine hole layout and land has been purchased to allow the development of a complete eighteen hole course. Two sets of tees are currently in use and each nine plays differently. Fairways are watered at night so golfers can enjoy an uninterrupted round during playing. In winter Mannum receives very little rain making it an ideal place to play when other golf courses are virtually unplayable due to wet conditions. The course has few bunkers and no water hazards - you will be thankful for this once you deviate from the fairway and experience the rough! 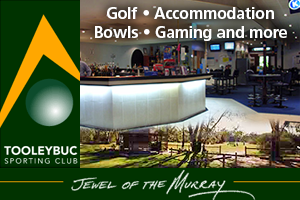 Murray Brige Golf Club is in the heart of the Rural City of Murray Bridge. The 18 hole course is supplied with picturesque surroundings, gently undulating fairways fringed with well established trees and excellent greens. The course is fully irrigated and offers superb playing conditions all year round. A nine hole course that improves itself by having tee off’s in different locations for the front and back nine. Another course that is nice and lush despite being in a very dry area. Not a lot of trouble around Tailem Bend with no thick rough to find your ball, but a few trees around the place can cause some concern if wayward. The 6th/15th is an interesting hole which plays as a long par 3 the first time round, and a short par 4 on the back. A nice big green and a narrow opening means this is a great hole. Only one par 5 on the course and thats the 9th/18th which runs along the Princes Highway bringing road trains into play if you happen to get the hook out. Good little nine hole course thats great value too, and as flat as any course you are ever likely to play. The Lake Albert Golf Club in Meningie, South Australia is a full 18-hole, Par 72 course. Situated 150kms from Adelaide. A 1½ hour drive down the South Eastern Freeway to Tailem Bend then turn right on to Highway 1 (Princes Highway). Once reaching Meningie continue through town, where the entrance to the golf course is 500 metres past the police station. A large sign is erected. South Lakes Golf Club, situated at Goolwa on the Fleurieu Peninsula and only 80kms from Adelaide by road. A seaside resort where the Murray River meets the Southern Ocean. Play golf on their 18 hole course with Santa Anna Couch fairways and excellent greens, set against a backdrop of sand dunes. Flat terrain and easy to walk.